This is a short story-based game, set in a world inhabited by Shapes. The graphics are inspired somewhat by the game boy. The windows link just have an image on it ? The game worked for me. Great work, lots of content, and humorous writing. The game felt very polished and the audio and graphics were both very well done. For such a short time you did a lot! I played the main story only but it came out more dark then I expected. The graphics and music fit very well. Great entry! Absolutely fantastic game. The story was touching and uncomfortable (in a good way). Not sure if I'm missing something, but nothing happened after I got 33/33 score. I'd recommend to anyone playing this that they don't try to rush it and just take their time to explore. the graphics and music were pretty good, it looks like you created a lot of content in such a short period of time. Your game matters and it is important. Thank you for the wonderful experience. Keep doing what you do. A game packed with details, nice graphics and a story. I don't know how you've managed to cram this much in there and there are some slower parts, but overall, very nicely done! Cool game, good story and mood. Great game, I love the story and the message. It has a lot of work, since the town is so big a map would have been great. Really good story, it made me a little sad, the personas of the shapes felt very real. However, I haven't finished it yet, as I wanted to save the game as it felt kinda long, but when I hit esc to bring up a menu, the game just reset. A longer ld-game like this could really benefit from a save function. I might revisit it later, because its really solid. Lovely. Great job on the retro aesthetics, and brilliant storyline, very zeitgeisty. 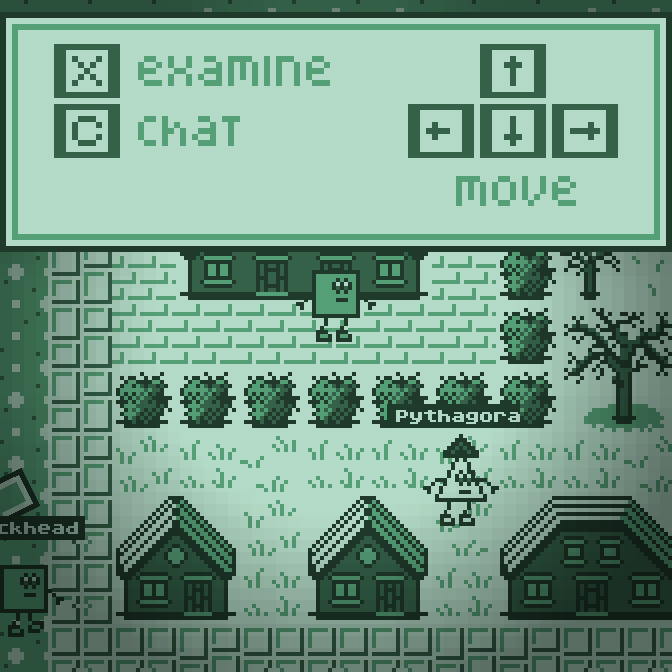 Flatwords meets the Gameboy in a fun narrative game world. Great job! Cute and really sad story. Really nice graphics, well done! wow, nice entry! so much detail and polish! sadly I pressed escape at 14/33 and it restarted with no warning. I didnt like the internet slang on the speech tho, it breaks the inmersion for me as I was pictureng the characters talking not chatting. The art and pallete is brilliant. Definetly one of my favourites entries!